Welcome to one of Peterborough’s hidden dining gems. Electric City Gardens offers an internationally inspired menu in an intimate, romantic setting that is relaxed and elegant. The owner, Chef Toby Tylor, approaches food with love and respect; he shops daily for local ingredients that are in season and every dish is made from scratch. Friends of ours join us for dinner to celebrate a birthday. Toby greets us at the door with a warm smile and a hug, and escorts us to our table in the back room. Charming and homey, our table is adorned with gleaming silverware, candlelight and the menu, hand written on the white board, propped on a chair for our review. Chef Toby focuses his attention to a select few dishes each night, so while the menu may not offer numerous choices, rest assured that each dish is crafted with only the finest ingredients. And, lucky for us, because we are a party of four, we are afforded the luxury of ordering every item off the menu so we can taste it all. I start my meal with the blue cheese, pear and dill salad; it is fresh, crisp and lightly drizzled with a creamy, citrus-infused dressing—a wonderful start to any meal. 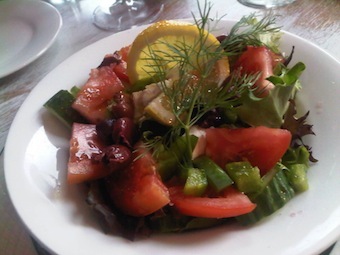 My husband savours a salad of field greens and mild, creamy goat cheese—as tasty as the ones we had in Barcelona—and our friend indulges in a steaming bowl of white bean soup loaded with fresh pepper and succulent pieces of ham. Toby carries the cheeses into the main courses, pairing the blue cheese with linguini for a decadent dish, and pairing the goat cheese with grilled shrimp and linguini for a more subtle, gentler dish (and may I add kudos to Toby for taking the tails off the shrimp before serving them). 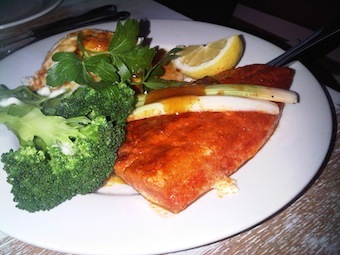 The Cajun salmon is cooked to perfection; flaky with just the right balance between flavour and spice. 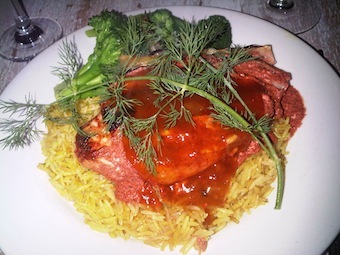 Tangy and dressed with smooth chutney, the Tandoori chicken is moist with a subtle hint of vinegar that works beautifully with the fragrant basmati rice. At this point in the meal, we are beyond satisfied, but we are celebrating a birthday and no birthday is complete without chocolate. We dive into Toby’s new creation of chocolate cobbler: traditional apple cobbler, only better. This one is drenched in freshly made chocolate sauce and dusted with icing sugar. The result—thick and rich and chocolaty heaven— is such that the apples are almost lost in this version. The crème-au-pot is a sinful cup of a thick chocolate mousse topped of with fresh whip cream. My favourite of the evening though is the light and fluffy almond cheesecake on a coconut graham crust. And yes, it is as good as it sounds. 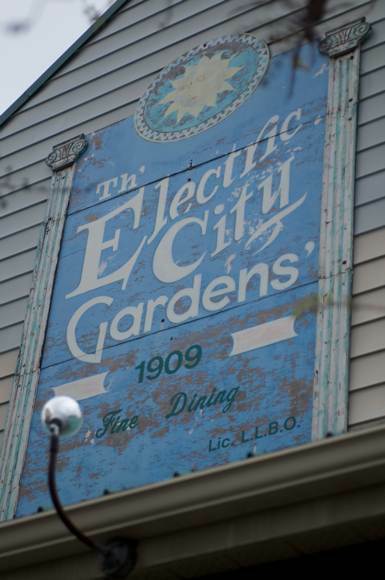 Tucked away on Queen Street a little off the beaten path of downtown Peterborough, Electric City Gardens is the perfect spot to nourish your soul with creative, delicious food and an eclectic wine list. Toby and his team provide wonderful individual service focused on attention to detail. We left pleasantly full yet hungry for more. We will be back.